There has been a long history of pipers and drummers in Wick going back to at least 1884 when they served as part time soldiers with ‘H’ (Wick) Company of the 1st Sutherland Highland Rifle Volunteers and the Territorial Units that followed. Although they had already been taught locally, their skills would be improved by the Army tutors who came north to train them. As well as playing at camps and local parades they would attend many local events in the town, so the sound of pipes around the town goes back a long way.It was not until after the First World War (1914 – 1918) that a private band was formed in the town in 1919. Although all details of the formation are lost, we know that the Band’s first name was the “Wick Comrades of the Great War Pipe Band” and were part of that organisation which by 1921 affiliated to the “Royal British Legion". It was in 1946 with the return of ex-servicemen that the Band was reformed. Once again the Band got off to a great start, playing regularly at many events and street parades. By now there were recruits coming through from the Scouts and Boys’ Brigade which strengthened the ranks. 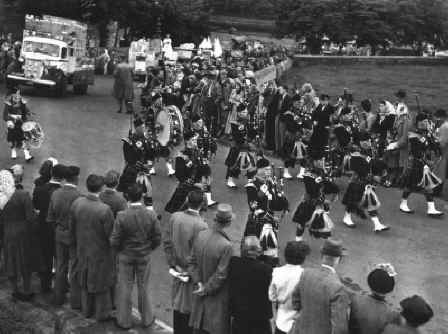 By 1949 the Band decided to change back to military style unifoms with MacKenzie tartan kilts and plaids, green tunics and black belts for pipers and red tunics and white belts for drummers, both wore white spats. During this period the Band name sometimes took a change being referred to as “Wick Men’s Pipe Band”. This came about because of the growing strength and popularity of the Wick Girls’ Pipe Band. They were beginning to play at many of the town and county events we were normally engaged for. Our strength slowly dwindled and by the late 1950’s the decline was obvious but we still managed the Armistice Parade, Kirkin O’ the Council, etc with a little help from Thurso. The next significant change took place on 2nd November 1984 when the Band affiliated to the “Royal British Legion Scotland Wick Branch” in an effort to stabilise the Band. The name was changed to “Wick RBLS Pipe Band”. 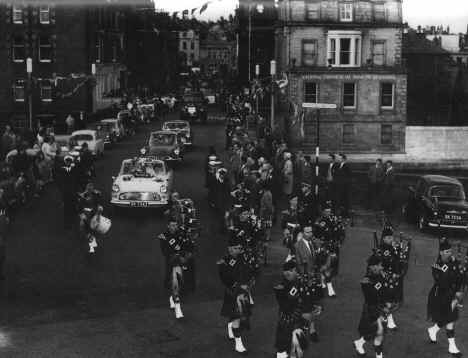 15th July 1989 Massed Pipe Band Parade to celebrate the town’s Quatercentenary celebrations. Ten bands took part in an afternoon and evening parade and a Highland Dancing display by 25 dancers. 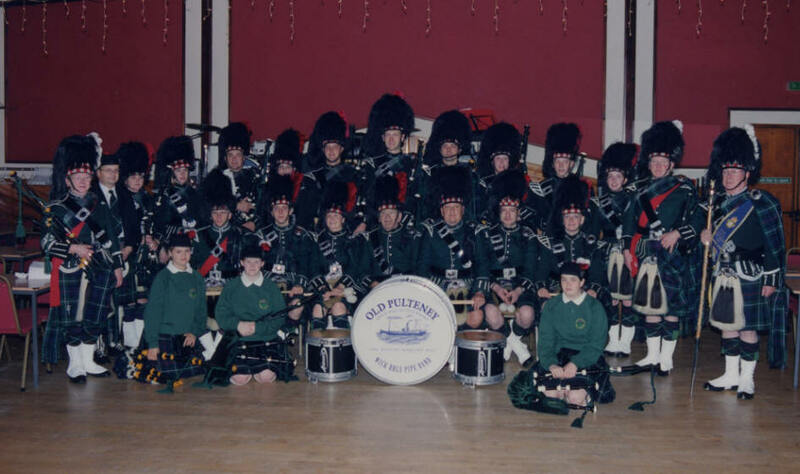 13th to 18th July 1992 The first “Pipe Band Week” which has proved to be a great success and continues to today. 5th September 1992 Dedication ceremony at Skitten to unveil a memorial to remember “Operation Freshman” when 34 commandos flew from Skitten in 1942 to destroy heavy water plants in German occupied Norway, all lost their lives. 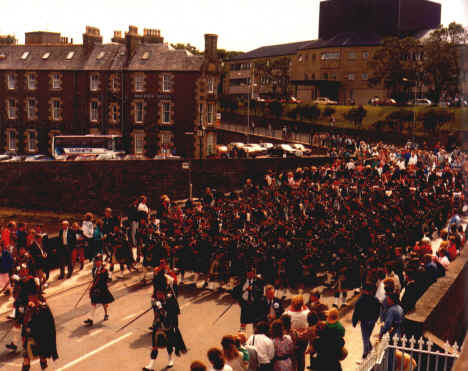 9th July 1994 Massed Pipe Band Parade to celebrate the Band’s 75th Anniversary. 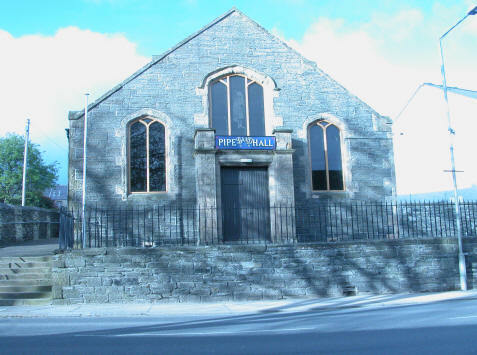 February 1995 The Band purchased the “Old Parish Church Hall” and renamed it the “Pipe Band Hall”. Now we have our own premises to meet and practice and to hold all manner of fund raising events. 8th May 1995 50th anniversary of Victory in Europe, the Band led many War veterans through the town to a moving service at the War Memorial and thereafter to the Parish Church and the Assembly Rooms. Into 2001 and the Band marches on, the last 19 years have probably been the best spell the Band has ever had in it’s 80 plus years history. The future looks good but we must always be aware of hiccups and make sure it is no more than that. The present Band is indebted to all the players of the past who struggled to keep it going and to the many helpers and supporters past and present, without whose valued help we would never exist. Between all of us the skirl of the pipes will still be heard in Wick for many years to come. Wick Pipe Band – A History by WT Lyall and AS Reid, has 144 pages including 70 photographs.